Yesterday I spent most of the afternoon in the garden. After I had looked at where and how I was going to put my veg, I spent an hour or so tidying up the rockery. This has become infested with old man’s beard and another plant the name of which I can’t remember. The root systems form a solid mat which it is almost impossible to remove, so I think I’m going to have to do some serious digging to get rid of it. To start off, I cut back the dead vegetation. This revealed some daffodils…. …and some hellebores which I planted several years ago. They didn’t do very much at first, but then they got going, and every year since, we have had more and more flowers. We have lots of spring flowers in our garden, but not much beyond June, so when I get 5 minutes, I’d like to add more colour for later in the year. I love being outside – our garden has a lovely peaceful atmosphere. 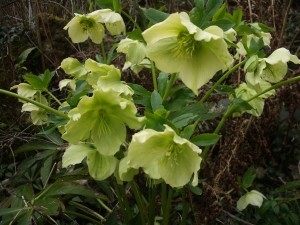 Which are your favourite spring plants? 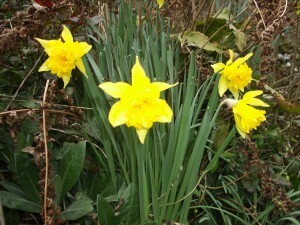 Daffodils are my favourite. In fact we got married in March (16 years ago today!!) so that I could have a bouquet of daffodils.